The Lansing Fire Department has lost one of its best-known captains. 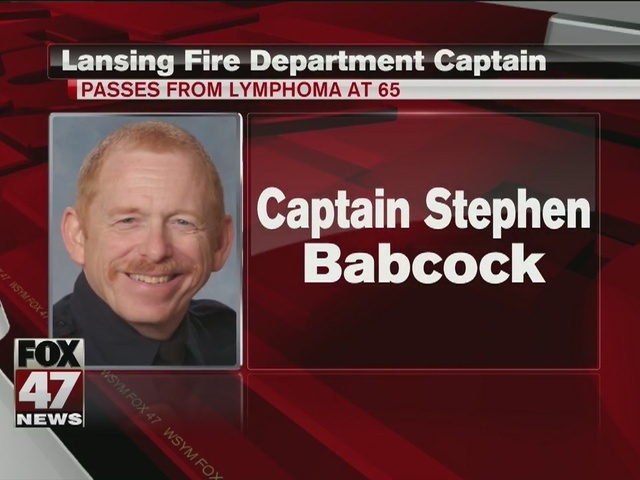 The Lansing Fire Department reports that Captain Stephen Babcock died Wednesday. He passed away from non-Hodgkin lymphoma. He was 65. "He passed while surrounded by his immediate family and many of his brothers and sisters from the Lansing Fire Department," said Chief Michael Tobin in a press statement. Capt. Babcock was a well-known spokesman for the Lansing Fire Department. Babcock oversaw the department's public information officers for several years. He was often interviewed by local media. "Steve truly was the 'face' of LFD," said Tobin. "He worked with our friends in the media for 15 years. He was always smiling, always available for a sound bite or a spot on camera." Capt. Babcock started as a fire department dispatcher in 1993. He transitioned to firefighter in 2003, and rose through the ranks. He was currently assigned as Captain in the Emergency Management Division. Babcock also served as the fire department's historian and maintained the department's museum. The FOX 47 News family sends its heartfelt condolences to Captain Babcock's wife, Mary, and his family and those he worked with at the Lansing Fire Department and the City of Lansing.